Monday’s raid on Trump’s personal lawyer upended talks for the president to sit down with investigators. On Monday Trump’s lawyers were discussing a possible interview with Mueller's team and had begun to hash out the final sticking points, including the timing, scope and length, according to people familiar with the discussions. One person familiar with the strategy said the president’s lawyers had sought over the weekend to expand his legal team to include individuals who would prepare him for an interview. Another person familiar with the matter, however, said preparations had not yet gone that far. White House Counsel Ty Cobb said it was “untrue” that talks had broken down. Rosenstein met with the president at the White House on Thursday. A White House official told reporters the meeting was about "routine department business." A Justice Department spokeswoman said it was part of a scheduled meeting with officials from other agencies as well as DOJ. The special counsel’s office declined to comment on this report or whether it would seek to subpoena Trump to testify before a grand jury. Since the FBI raid seizing Cohen’s documents and electronics, Trump has soured on the idea of sitting for an interview with Mueller, people familiar with his thinking said. Trump’s lawyers were wary of him agreeing to a sit-down, but in the days before the raid they had started initial preparations for Trump to take part in a possible interview in part because the president could overrule their advice, people familiar with the discussions said. Prior to the FBI raid on Cohen, Trump’s legal team also had been preparing various approaches depending on how discussions with Mueller concluded, people familiar with the matter said. If Trump were to decline a voluntary interview, his legal team discussed making the case that a sitting president can’t be subpoenaed, according to people familiar with the discussions. The argument hinges on the idea that a sitting president can’t be indicted, with Trump’s lawyers surmising that if a president can’t be indicted he can’t be subpoenaed. It’s unclear what other top Trump aides Mueller has left to interview. He still hasn’t requested an interview with Vice President Mike Pence and may be unlikely to do so, two people familiar with the matter said. Trump’s son-in-law and senior White House adviser, Jared Kushner, and Donald Trump Jr. have both been focuses of the investigation. 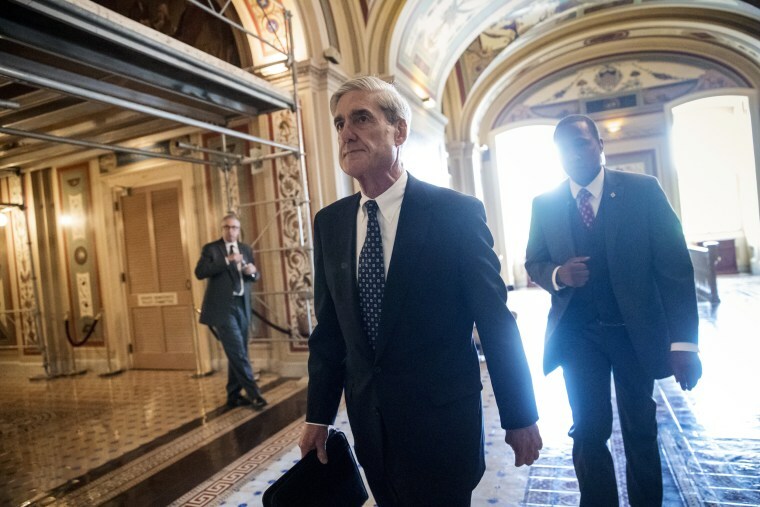 Mueller has indicted Paul Manafort, Trump’s former campaign chairman, and secured plea deals and cooperation agreements from Trump's former national security adviser Michael Flynn and campaign aide Rick Gates, as well as Russian individuals and others accused of lying to the FBI or helping Russia interfere in the U.S. presidential election in 2016.